I was sitting in the Dolmen centre at Kilclooney, drinking coffee and reflecting on my visit to the dolmen with Deb. It was a beautiful day and we had managed to get some great shots. I was also looking forward to our trip to Glencolumbkille, which we had planned for later that day. As we were so close to Narin I decided to see if the Island of Inishkeel was accessible.,During the low tides of the spring months it is possible to walk out across a sandbank to the island, traditionally this was the time a pilgrimage took place to the ecclesiastic site on the island. This decision turned out to be the highlight of our week in Donegal. 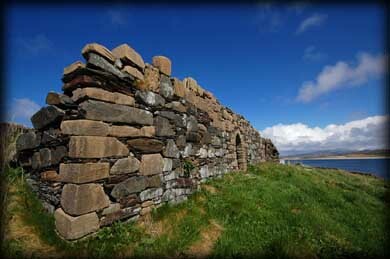 St Conal founded a monastery on the Island in the late 6th century. 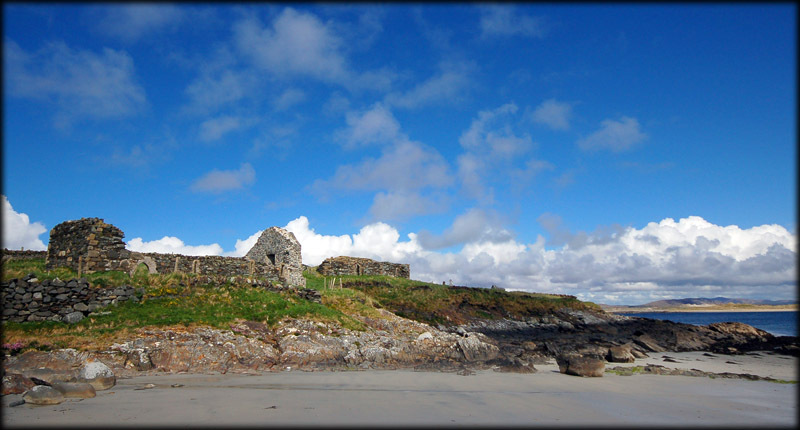 There are the the remains of two 12th century churches, St Conal's church pictured right and St Mary's shown above. 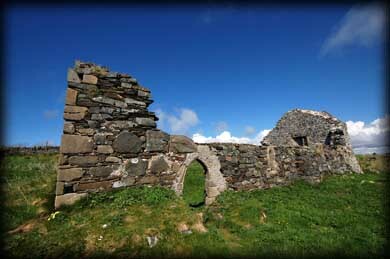 The northern gable of St Conal's was recently reconstructed and each stone still bears a number in white paint. Although very little remains of the western wall there are still some wonderful features present in the other walls, amongst these are the large quoin stones and the wonderful door and windows. St Mary's too has large quoin stones and placed on top of the eastern wall are some broken carved stones with what appear to be romanesque details. 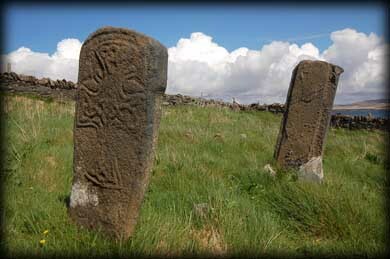 One of the main reasons for me wishing to visit Inishkeel was to view the fabulous cross slabs present at the site The slab shown left, is in excellent condition and is beautifully decorated on both sides with a cross. This cross slab probably dates to around the 8th/9th century, I will try to confirm this soon. 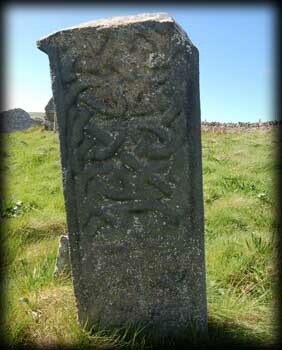 The slab shown below is said the be the thin shaft of a high cross dating to around the 11th/12th century. It is also beautifully decorated with an interlace design and below the interlacing is some figure sculpture. Also present in the graveyard is a large boulder, traditionally known as St Conal's bed. Near the site is St Conal's holy well. The location of this site is simply breath taking and if you are in the area well worth visiting. A relic of St. Conal remained in Ardara until 1844. It was the saint's bell, named Bearnan Chonaill. It dates from the 6th century and was made from iron, around the 11th century a plate of brass that bears irish and viking interlace was added. The bell is now part of the British Museum collection. Situated: From Ardara, County Donegal, take the R261 north, after 8 kilometres take a right turn for Portnoo. The first beach on you right at Narin is Tramore strand. Park here and walk straight across the beach to the nearest island. When you reach Inishkeel keep walking down the beach to the right towards the church in the distance. Discovery Map 10: B 7102 0008. Last visit Apr 2010.